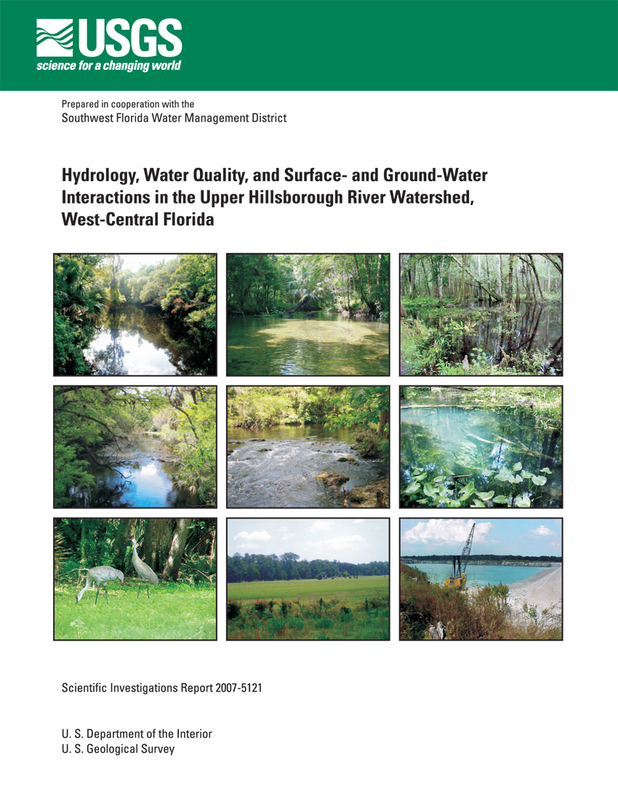 A study of the Hillsborough River watershed was conducted between October 1999 through September 2003 to characterize the hydrology, water quality, and interaction between the surface and ground water in the highly karstic uppermost part of the watershed. Information such as locations of ground-water recharge and discharge, depth of the flow system interacting with the stream, and water quality in the watershed can aid in prudent water-management decisions. The upper Hillsborough River watershed covers a 220-square-mile area upstream from Hillsborough River State Park where the watershed is relatively undeveloped. The watershed contains a second order magnitude spring, many karst features, poorly drained swamps, marshes, upland flatwoods, and ridge areas. The upper Hillsborough River watershed is subdivided into two major subbasins, namely, the upper Hillsborough River subbasin, and the Blackwater Creek subbasin. The Blackwater Creek subbasin includes the Itchepackesassa Creek subbasin, which in turn includes the East Canal subbasin. The upper Hillsborough River watershed is underlain by thick sequences of carbonate rock that are covered by thin surficial deposits of unconsolidated sand and sandy clay. The clay layer is breached in many places because of the karst nature of the underlying limestone, and the highly variable degree of confinement between the Upper Floridan and surficial aquifers throughout the watershed. Potentiometric-surface maps indicate good hydraulic connection between the Upper Floridan aquifer and the Hillsborough River, and a poorer connection with Blackwater and Itchepackesassa Creeks. Similar water level elevations and fluctuations in the Upper Floridan and surficial aquifers at paired wells also indicate good hydraulic connection. Calcium was the dominant ion in ground water from all wells sampled in the watershed. Nitrate concentrations were near or below the detection limit in all except two wells that may have been affected by fertilizer or animal waste. Wells at the Blackwater Creek and Hillsborough River at State Road 39 transects showed little seasonal variation in dissolved organic carbon. Dissolved organic carbon concentrations, however, were greater during the wet season than during the dry season at the Hillsborough River Tract transect, indicating some influence from surface-water sources. During dry periods, streamflow in the upper Hillsborough River was sustained by ground water from the underlying Upper Floridan aquifer. During wet periods, streamflow had additional contributions from runoff, and release of water from extensive riverine wetlands, and by overflow from the Withlacoochee River. In contrast, streamflow in Blackwater and Itchepackesassa Creeks was less constant, with many no-flow days occurring during dry periods. During wet season storm events, streamflow peaks occur more rapidly because there is greater confinement between the surficial deposits and the Upper Floridan aquifer, and these creeks have been highly channelized, leaving less of the adjacent wetlands intact. During dry periods, Blackwater Creek is dry upstream from its confluence with Itchepackesassa Creek, and all downstream flow is from Itchepackesassa Creek. Much of the dry season flow in Itchepackesassa Creek originates from a treated wastewater effluent outfall located on East Canal. Long-term streamflow at the Hillsborough River and Blackwater Creek stations was greater than the discharge observed during the study period. Water quality in the upper Hillsborough River is influenced by ground-water discharge. The chemical composition of water from Blackwater Creek, Itchepackesassa Creek, and East Canal was more variable because there was less ground-water discharge to these creeks than to the upper Hillsborough River, and because of the influence of wastewater effluent. Strontium isotope data indicated that the source of the water at all Hillsborough River sites during the dry season was the Oligocene-age Suwannee Limestone, and that water from Blackwater and Itchepackesassa Creeks as well as East Canal was from shallower zones in the Upper Floridan aquifer. Bacteria samples indicated that the most likely sources of bacteria are cattle and native animals. Thirty-eight organic wastewater and pesticides compounds were detected at five sites; however, concentrations were typically less than 1 microgram per liter. Nitrogen species varied at the Hillsborough River sampling sites seasonally and in a downgradient direction. The dominant species of nitrogen in water at the three upstream sites was total Kjeldahl nitrogen, and is probably from riverine wetlands and cattle grazing activities. Inorganic nitrogen was the dominant species at the three downstream sites, and is probably from ground-water sources. Nitrogen isotope data indicate the nitrogen is from mixed sources. The dominant species of nitrogen in water from Blackwater and Itchepackesassa Creeks was total Kjeldahl nitrogen, similar to the upstream Hillsborough River sites. Estimates of streamflow gains and losses were made along the main channel of the upper Hillsborough River, Blackwater Creek, Itchepackesassa Creek, and East Canal. During May 2001, losing and gaining stream reaches were observed in all subbasins. During November, the only losing stream reaches observed were in the East Canal and Itchepackesassa Creek subbasins near their confluence. Ground-water contributions to the streams were estimated at continuous record stations using hydrograph separation methods. Average mean annual base flow ranged from about 4 to 9 inches per year. This method probably overestimates base flow because of flat gradients and extensive wetlands located in the watershed. Ground-water discharge to the streams was simulated using a two-dimensional cross-sectional model at three transect sites along the Hillsborough River and Blackwater Creek, and ranged from about 0.05 to 1.6 inches per year. Trommer, J.T., Sacks, L.A., and Kuniansky, E.L., 2007, Hydrology, Water Quality, and Surface- and Ground-Water Interactions in the Upper Hillsborough River Watershed, West-Central Florida: U.S. Geological Survey Scientific Investigations Report 2007-5121, 71 p.